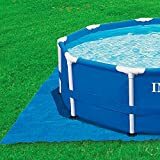 Intex Metal Frame Pool Reviews If you are looking for an above ground pool which is better than the inflatable ones yet strong and durable, then the Intex Metal Frame pool would be the right choice for you. This metal frame swimming pool is a top bestseller and is considered as an above ground pool with the most value for money. It is of course a step down from the Intex Ultra frame pool in certain respects yet is very durable and will last you a number of seasons of fun and good times with family and friends. The Intex metal frame pool is super easy to setup. It comes with strong durable steel frames with a specially designed, triple layered, ultra strong laminated sidewalls for grossly minimizing the risk of wear and tear and to prevent unwanted leaks. The Intex above ground metal frame pool doesn’t require any additional tools to setup. The snap-on joints makes it a breeze to get the pool of running although some additional hands are recommended to keep the structure in an erect position while assembling the structure. Most people start using the pool on the same day of setup. As easy as it is to setup the pool, dismantling it isn’t much of a headache either. In fact it is recommended that the pool be dismantled and stored away when not in use. It takes very little space for the packed up Intex metal frame pool to store during off seasons. Places where there is heavy snowfall, it is best to pack and tuck away the above ground pool or you stand the risk of damaging the above ground pool liners as well as steel frames from rupture and cracks. In places of warmer climate the pool can use all year round by using above ground pool heater or solar above ground pool covers during the winter months. 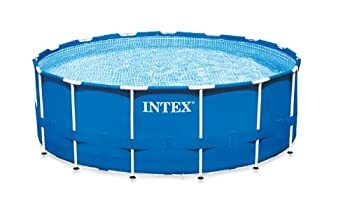 The Intex metal frame pool is available only in a circular version. Also setup of the pool is easy for all sizes. 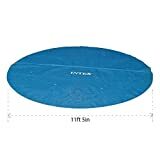 The sizes available for the Intex metal frame above ground pool are: Intex 12 Feet x 30 inches (12 feet is the diameter) Intex 15 Feet X 48 inches Intex 18 Feet X 48 inches Intex 24 Feet X 52 inches You must choose the variant depending upon the size of your family or the number of people you wish to accommodate in the pool. How to install Intex metal frame aboveground pool The primary requisite for a steadfast and balanced install of an aboveground pool is that the ground on which the pool stands is flat and leveled. One must repair the ground in case of visible soft sand and lose mud prior to installation of the above ground pool. It is always recommended that the ground be cleared of any grass or shrubs. After clearing the ground place a ground cloth or a tarp on which to install Intex metal frame above ground pool. 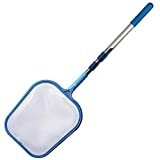 This would greatly eliminate the chances of leaks or holes caused in the pool liners. Always refer to the installation DVD that comes with the Intex above ground pool for a complete step-by-step instruction on how to go about the installation. Apart from that one can refer to Youtube for additional help to get the Intex Metal Frame pool up and running. The Intex metal frame pool comes bundled with a patented Krystal Clear cartridge filter pump. This pump is inadequate to serve the water volume of the Intex metal frame pools. Moreover, there is a recurring costs involved on replacing the used cartridges .It would be a wiser decision to go for an Intex sand filter pump which would actually be effective on the large water body within the pool. You can read a review about it here on above ground pool pumps. If you’re planning to set up the Intex metal frame pool in your backyard than it would be a good idea to bundle your purchase with an aboveground pool cover. This will help you keep your pool covered from leaves, bugs and unwanted debris. The Intex Metal Frame pool has some very good reasons to be a bestseller in above ground pools niche. It is reasonably priced, easy setup and dismantle features and above all the quality of the product is extremely good. Hence customer complaints are a minimum. We have tried to put together a thorough review of the Intex metal frame pool along with its pros and cons. We sure hope you enjoy reading the material and make an informed decision in your purchase of an aboveground pool. We suggest you further equip yourself with more in-depth reviews in our aboveground pool supplies and aboveground pool accessories sections. You can even find more hands-on articles about pool fun and maintenance in our aboveground pool 101 section. You can join our community on Facebook by liking us here. We usually keep our readers updated with seasonal offers for them to take advantage of coupons and deals. You can also share your experience with your aboveground pool and ask the community for help and suggestions related to your pool. We sincerely hope you have a wonderful time with your kids, family and friends in your above ground pool for years to come.